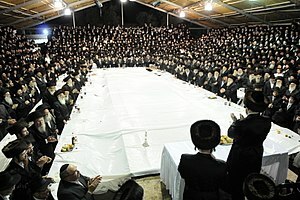 A tish o the Boyan Hasidic dynasty in Jerusalem, haliday o Sukkot, 2009. Hasidism, sometimes Hasidic Judaism (Ebreu: חסידות‎, transleet. hasidut‎, [χaˈsidus]; originally, "piety"), is a Jewish releegious group. It arose as a speeritual revival muivement in contemporary Wastren Ukraine in the 18t century, an spreid rapidly ootthrou Eastern Europe. The day, maist affiliates reside in Israel an the Unitit States. This page wis last eeditit on 3 Dizember 2018, at 00:02.